The Independent National Electoral Commission (INEC) released the final list of candidates for the February 16 National Assembly polls. No candidates were listed for the APC in Rivers. The party has been embroiled in internal crises leading to the disqualification of its candidates, following its failure to conduct acceptable primaries. APC presidential candidate President Muhammadu Buhari and Atiku Abubakar of the People’s Democratic Party (PDP) lead other 71 presidential candidates. Obaje Yusufu Ameh (ANDP) and Durotoye Adetokunbo Olufela (ANN). Obinna Uchechukwu Ikeagwuonu (APP); Dara John (ASD); Angela Johnson (AUN); David Esosa Ize-Iyamu (BNPP); Ojinika Geff Chizee (C4C); Abah Lewis Elaigwu (CAP); Etim Emmanuel Ishie (CNP); Ukonga Frank (DA); Awosola Williams Olusola (DPC) and Osakwe Felix Johnson (DPP). Others are: Dr Onwubuya (FJP); Okotie Christopher Oghenebrorie (FRESH); Akhimien Davidson Isibor (GDPN); Eke Samuel Chukwuma (GPN); Albert Owuru Ambrose (HDP); Madu Nnamdi Edozie (ID); Chukwu-Eguzolugo Sunday Chikendu (JMPP) and Fagbenro-Byron Samuel Adesina (KP). Rabia Yasai Hassan Cengiz (NAC); Ademola Babatunde Abidemi (NCMP); Salisu Yunusa Tanko (NCP); A. Edosomwan Johnson (NDCP); Akpua Robinson (NDLP); Ishaka Paul Ofemile (NEPP); Asukwo Mendie Archibong (NFD); Atuejide Eunice Uche Julian (NIP); Ike Keke (NNPP); Maina Maimuna Kyari (NPC); Ibrahim Usman (NRM); Moses Ayibiowu (NUP); Felix Nicolas (PCP); Abubakar Atiku (PDP) and Ameh Peter Ojonugwa (PPA). They include: Victor Okhai (PPC); MAJOR HAMZA AL MUSTAFA (PPN); Gbenga Olawepo-Hashim (PT); Israel Nonyerem Davidson (RAP); Osuala Chukwudi John Kennedy (RBNP); Nsehe Nseobong (RP); Da-Silva Thomas Ayo (SNC); Ahmed Buhari (SNP); Balogun Isiaka Ishola (UDP); Mark Emmanuel Audu (UP); Inwa Ahmed Sakil (UPN); Nwangwu Uchenna Peter (WTPN); Ali Soyode M. (YES) and Moghalu Kingsley Bosah Chiedu (YPP). The presidential candidate of the Social Democratic Party (SDP) was, however, omitted following the legal tussle between former Cross River Governor Donald Duke and former Information Minister Prof. Jerry Gana. In all, 1,904 candidates are vying for the 109 seats in the Senate; 4,680 are to battle for the 360 seats in the House of Representatives. According to INEC, 225 women are contesting for senatorial seats. The figure is the highest ever. Five APC governors made the list for election into the Senate. They are Ibikunle Amosun, Ogun; Kazeem Shettima, Borno; Abiola Ajimobi, Oyo; Rochas Okorocha, Imo and Ibrahim Gaidam, Yobe. The oldest candidate on the list is former Nasarawa State Governor Abdullahi Adamu, 72. He is followed closely by 71 years old Tanno Patrick Onobughakpo of Kowa Party, who is contesting for Delta South. Also on the list, which was signed by INEC Secretary Mrs. Rose Oriaran-Anthony, are Senator representing Lagos Central Oluremi Tinubu, Patrick Obahiagbon, Godswill Akpabio, Senate President Bukola Saraki, Dino Melaye, Smart Adeyemi and others. The commission also laid to rest the controversy over the list of candidates for the Ogun State chapter of the People’s Democratic Party (PDP). The electoral body listed the names of candidates submitted by the Adebayo Dayo-led Ogun State PDP Executive as candidates of the PDP for the National Assembly election. The Dayo-led Ogun State PDP Executive is the structure supported by the Senator representing Ogun East, Buruji Kashamu, who is the state’s PDP governorship candidate. For the senatorial candidates, the list has Apostle Solomon Abiodun Sanyaolu as the PDP candidate for Ogun Central; Sosanwo Adeola Ayoola for Ogun East and Honourable Odunjo Odunleye Abiodun for Ogun West. For the House of Representatives’ candidates, listed are Mrs. Lanre-Balogun Abimbola for Abeokuta North/Obafemi-Owode/Odeda Federal Constituency; Showunmi Olusegun for Abeokuta South Federal Constituency; Sunmonu Monsuru Olusegun for Ado-Odo/Ota Federal Constituency; Kojeku David Olusola for Egbado North/Imeko Afon Federal Constituency; Ajose Suru for Egbado South/Ipokia Federal Constituency; Adesina Olufemi for Ifo/Ewekoro Federal Constituency. Others are Taiwo Kabir Shote for Ijebu Ode/Odogbolu/Ijebu North East Federal Constituency; Adekoya Adesegun Abdul-Majeed for Ijebu North/Ijebu East/Ogun Waterside Federal Constituency and Lawal Alaba Isiaka for Ikenne/Shagamu/Remo North Federal Constituency. Kashamu described the development as “victory for resilience and the rule of law”, saying there was “no victor, no vanquished”. He said with the publication of the final list by INEC, it was incumbent on lovers of the party to close ranks and work to deliver Ogun State for PDP. 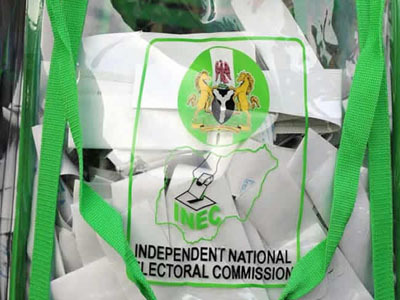 The INEC Resident Electoral Commissioner (REC) in Rivers State, Mr. Obo Effanga, said the removal of names of APC candidates for the February 16 and March 2 elections was in compliance with a court order. Effanga said yesterday on a local radio in Port Harcourt that as a law-abiding commission, it had to comply with the order of the court. Efforts were made by The Nation to speak with Rivers REC, but he did not answer his calls. INEC denied the allegation that it was issuing out Permanent Voter Cards (PVCs) to political party chieftains as claimed by PDP presidential candidate Atiku Abubakar. According to the Chief Press Secretary to INEC chairman, Mr. Rotimi Oyekanmi, the commission’s policy on collection of PVCs stands. Oyekanmi maintained that no official of INEC would agree to collection by proxy.